It has been a while since I have posted anything, but I have a quick week night dinner that you are going to love. 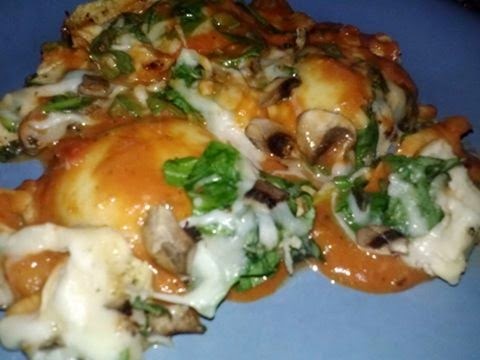 It's called Ravioli Chicken Florentine. Boil ravioli and allow to cool. Arrange on a greased baking dish. Season and grill or saute' your chicken breast. I prefer to season my chicken with McCormick's Montreal Chicken Seasoning, Morton's Season Salt and pepper. Slice and arrange on top and around the chicken. Slice and arrange the mushrooms and spinach. Pour the sauce on the ravioli until completely covered. 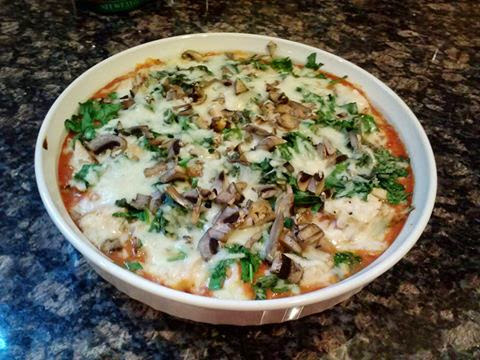 Top with the mozzarella cheese and sliced basil. Bake until cheese has completely melted. Serve with warm garlic bread or rolls. Please leave a comment below the post that you read, and let me know what you think. I am so excited that people from all over the world visit my blog daily. I would love to get your feedback. You can also e-mail me directly at ahawes6@comcast.net. Thanks! Here is a quick and fresh dessert to serve at your next dinner party. Black Berry Parfait. It is unbelieveably easy. * Some pretty glasses, i.e., champagne, martini, etc. Wash and arrange the berries. Layer with topping and serve. Do you want to cut down on calories, yet have a tasty dish when eating breakfast? Then try making an Egg White Omelet. I make my omelet the night before and warm it up in the microwave the next morning when I'm ready to eat it. The nice thing about making an omelet is that you can toss in your favorite veggies and meat. Separate 3 white eggs. Put the yolks in a container to be used within the next few days for another dish. Beat the egg whites and add salt and pepper. Oil your skillet thoroughly with olive oil and heat up your pan on low heat. Pour the egg whites in the pan. When your omelet is starting to cook, add your chopped veggies and cheddar cheese. Fold your omelet closed and then flip it on the other side. The weather in the Northeastern part of the U.S. has definitely been frightful within the last week. What better dish to make on a cold night like this is White Bean Chicken Chili. Now I have to be honest.....I hate beans, but my friends at work, John and Lori asked me to come up with a recipe for this dish. So I came up with a quick recipe that is easy to make after a long day at work. Wash, season and cook your chicken. I like to grill mine a little to get the smoky flavor and then cook it the rest of the way in the pot after I have chopped it up. While the chicken is cooking, this is a good time to chop up your vegetables. In a large pot with about 3 tablespoons of oil, sautee' the veggies for 5-7 minutes. Add in the chopped chicken and continue to stir. Once the chicken and the veggies have been married, stir in the chicken broth. Allow to simmer on low heat. After about 5-10 minutes, stir in the white beans, corn, tomatoes and green chili peppers. Continue to stir and allow to simmer. To thicken your sauce stir in about 2 to 3 tablespoons of flour. Thicken to your satisfaction. If it comes out too thick, add a little water to thin your broth out. Season with salt, pepper, chili powder and a few dashes of hot sauce. If you want more "heat", add more seasoning. Serve with or without rice with cornbread. Valentine's Day is approaching and you may be starting to think of dishes to make for that special someone. Filet of Oscar is one of my very favorites. It is somewhat involved, but well worth it. Wash and season the filet. Grill or broil until cooked to your liking. While the filet is cooking, in a seperate pan, heat your crabmeat. I like to add a little seasoning salt for flavor. Preheat your broiler for the asparagus. I like to season the asparagus and brush it with olive oil, and cook it for approximately 5 minutes or until it turns bright green. Once everything is cooked, put the filet onto a plate, and then top with the crabmeat. Note: Typically the asparagus is put on top of the filet in a cross and then topped with the crabmeat. Drizzle Bernaise Sauce on top of your Filet of Oscar. You can either make your sauce from scratch, or cheat and use the packaged Knorr's Bernaise Sauce. Here is an idea for a salad that I made for Phillip one day. In addition to using tomatoes and cucumbers, I also added boiled eggs, grilled chicken, grilled red peppers and green apples. Check it out! If you're entertaining for Christmas, check out my recipe ideas for appetizers to serve your guests as they are arriving. Tickle their taste buds with mini crab cakes, mini quiches, nachos, fried zucchini or stuffed mushrooms to name a few. How about serving a hot cup of chowder to your guests when they come in from the cold? Thanksgiving is approaching so we're all getting our menus together for a successful dinner. Check out some of recipes for a really easy and moist turkey, macaroni and cheese, mashed potatoes, candied yams and whatever else you can find searching A's Home Cooking. Have a delicious holiday! For years I have heard about a dish named Coq Au Vin and wondered what it was. I thought it was a Mexican dish. Well I could not have been more wrong! Coq Au Vin is a french chicken dish that I absolutely love! I made it relatively fast and simplified it. So, here we go! Clean and season your thighs. In a large pot, pour in about 3 tablespoons of olive oil and about 2 scoops of butter, and heat. Place chicken in the pan and brown lightly on each side. Remove and place on a dish. Cut the bacon into small slices and add to the pan. Now add the onions, celery and carrots. Add a couple of cap fulls of Brandy and scrape your pot to mix everything together. Add about 3-5 tablespoons of flour and continue stirring. Now, add your 3-4 sprigs of thyme and mushrooms. Continue stirring. Add 2 cups of chicken broth, 1 cup of Red Cooking Wine and 3 bay leaves. Allow to simmer for about 5-10 minutes. Place the chicken into a large roasting pan and pour the mixture over the chicken. Cover and place in the oven for approximately 1 1/2 to 1 3/4 hours.